Organic Farro, Triticum spelta, is high in fiber and a good source of iron and protein. Farro is easy to digest, allowing one's body to readily absorb the nutrients. Traditionally, Farro is very lightly scratched to allow for a faster cooking time and to encourage the release of its starches during cooking and it maintains its wholesome nutrients. 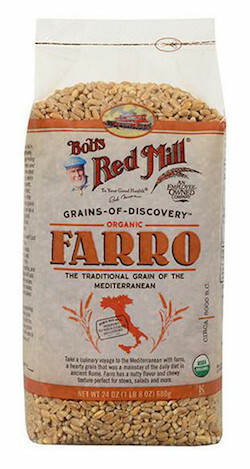 Farro is an ancient relative of modern day wheat. It was a mainstay of the daily diet in ancient Rome and is still popular in Italy today. Farro is hearty and chewy with a rich, nutty flavor. Use in stews, casseroles, salads and pilafs. Farro makes an excellent substitution for brown rice and wheat berries.